We’ve all had those spammy emails, right? But this email would be far from spam. This email would be from the producers of This Old House, the inspiring home improvement show on PBS, telling me that I’ve been chosen as an apprentice for the 2017-2018 season of TOH! Back in April I quietly applied for an opportunity to become an apprentice on This Old House. I only told those close to me in real life, asking them for help with Letters of Recommendation, as well as thoughts and prayers that the cast and producers saw enough potential to select me! I had learned about the casting call from Kevin O’Connor himself, the host of This Old House. 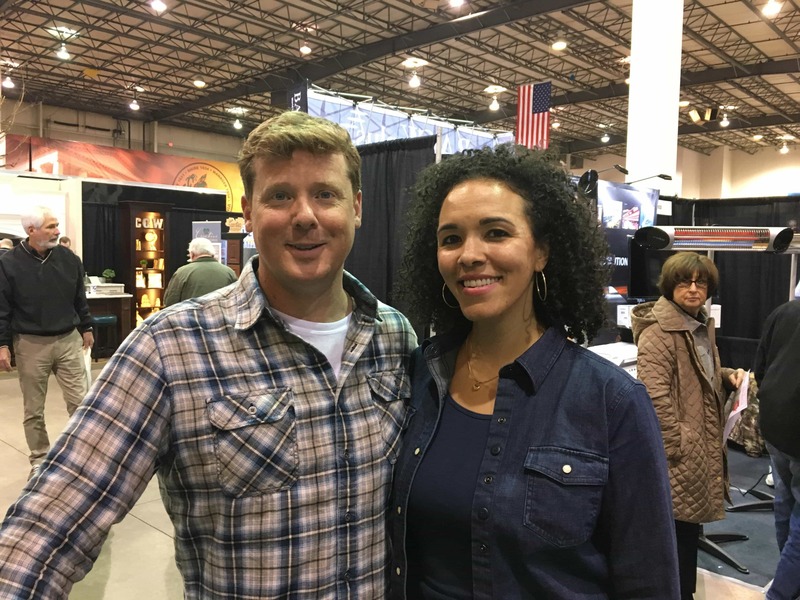 We were both presenting on-stage at the Richmond Home Show, and during his presentation, he mentioned that the show was looking for three apprentices for their Generation NEXT casting call. As Kevin explained during his presentation, many older folks are retiring out of the building trades. All those grandfathers are hanging up their hammers, leaving a shortage of talented young people to follow in their skilled footsteps. The solution was for TOH to team up with the mikeroweWORKS Foundation to get young people trained up in the trades and to offer scholarship opportunities, including this apprenticeship opportunity! You can read more HERE about the problem and their commitment. The moment I heard about this opportunity, a fire ignited in my soul! My grandfather was proud to have a grandchild following in his footsteps. As a carpenter who built houses all over Maryland, it was a joy to see his granddaughter wielding power tools and teaching herself how to do home improvement projects. I’m thankful he was able to see my passion for building before he passed away in 2016. It was a disappointment, though, that I didn’t discover my love of carpentry and building until well after he had retired. I always wished I could shadow him on job sites and learn everything he knew about building and renovating homes. Buying our old home in 2010 forced me to rely on myself to turn the house into a home. We couldn’t afford renovations or decor. It became all about thrift stores, and later, about power tools to build and do my own home improvements when possible! But the amount that I don’t know is overwhelming. I’ve had this craving to learn more about home improvement and to grow my skills so that I could help other people renovate their own homes, one project at a time. With this apprenticeship, the learning curve would be steep, which is just want I need. The Generation NEXT apprenticeship is the vehicle in which I can help people and grow my skills! The application process was pretty easy! I had to submit my resume, answer a few questions, and get two letters of recommendation from colleagues. They also wanted a video explaining why this opportunity was important to me, and to tell them a little more about myself. Here’s the video that I put together for my application! Surely thousands of young men and women submitted their applications, wanting this opportunity of a lifetime. But I feel like I’ve got something special to give: commitment, passion, an intense desire to learn, and the drive to help other people turn their old homes into their oasis. My mission is that one day everyone will have the skills to do their own DIY projects with confidence. This apprenticeship means an opportunity for me to increase my skill set so that I can help homeowners (especially you all!) increase their skill set–through videos, blog posts, and in-person presentations! Eventually, I would love to travel to homeowners and help them in their own homes! And even if people can’t do the projects themselves, I want to teach people how to understand their homes so it’s not a scary, intimidating homeowners experience. I am a teacher at heart, and I have the patience and drive to show people how to tackle their own homes. I just need the opportunity to learn so that I can put the right information into people’s hands! According to the website, winners were to be notified by May 1st. However, their rules page says May 5th. Well, today is May 3rd, you guys. I can only hope that the competition was so tough that they needed a few extra days to make their final selections. And I hope that I am one of those selections! This Old House will be buying a home to renovate and the three apprentices will spend 10 weeks working on the house in Boston this summer! The 2017-2018 season of the show will be showing the progress in real time, along with social media updates. And of course, if I am selected, you know I would be blogging and filming the entire process, showing you week-by-week the progress on the house! Profit from the sale of the house will be used to fund the mikeroweWORKS scholarship! Keep Me In Your Thoughts! This week as I wait for an answer on whether I was selected, please keep me in your thoughts! Working as an apprentice to learn carpentry has been a dream of mine for a very long time. It’s exciting to think of how much I would learn in 10 weeks and how that information would help you along in your own projects! Congratulations, and good luck!! I can see you in the role perfectly. 🙂 They’d be silly to turn you down. Congratulations on your progress, any opportunity to learn a new skill is a big accomplishment. I am praying for your continued success. Sabrina, i know one thing, they don’t know what they have missed if they don’t pick you to be on the show. I would put you up against any man that they pick. Prayers are going up for you to get on the show. If by some reason they don’t pick you, just remember you are good, (great) and they are the losers. Please keep us in touch. My husband is a huge fan of This Old House and has watched it for years and years……..I’m crossingmy fingers and toes for you!! You go Girl!!!! All of your readers are PULLING FOR YOU!!! !